Today the Staunton chess set lives on in abundance, literally thousands of sets are made every year and it continues to be the standard set among all the word's chess federations. Since the original inception all those years ago plenty of variations of the design have been created. 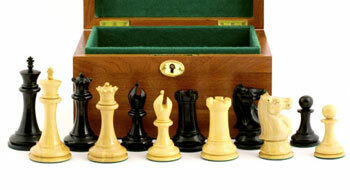 The patent held by Jaques of London ran out some years ago so a host of producers around the world design, make and sell Staunton chess sets. Jaques of London are still trading and offer a good range of Staunton chess sets, some of which claim to be exact reproductions of their original sets. Jaques are no longer based in London, they moved to Kent some years ago. Their sets are now produced in India by a third party manufacturer. The quality is still excellent and the closest thing you will get to the genuine article. The original sets have become very valuable antique collectors’ items and it is not uncommon to see them change hands for four figure sums. If you are lucky enough to find an original set, complete and in good condition you should consider yourself very fortunate indeed. There is a wealth of information online and in printed format to help collectors date and authenticate their antique Staunton chess pieces. Modern day chess set designers have taken the Staunton design to a new level and the market is awash with some very lovely designs based on the Staunton sets. It would be a bold move to suggest that improvements have been made to the original design by some producers. But it’s fair to assume that there are some really beautiful sets being made today that owe their existence to Howard Staunton and John Jaques.